The 4 digits and 6 digits digital NTP clock WCK004 display hour/minute or hour/minute/second with high visibility (up to 80m), on both sides. The analog NTP WCK002 wall clock displays hour/minute/second with high visibility. Both are automatically synchronized by NTP/SNTP, for example driven by T101 or T103 NTP servers, synchronized by GPS. It connects automatically to the local network thanks to the DHCP protocol, and detects automatically NTP servers available on the network. International time Zone and Daylight saving time are managed easily through the web interface of the GPS Time server. 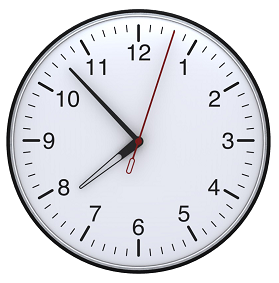 The Broadcast setting function enables all NTP clocks to get the same setting at the same time (network management system). Mounting kits are also available for easy integration, as well as PoE (Power over Ethernet).